Lay out your boxes in the design of your skeleton. You will need boxes for the skull, ribcage, pelvis, 2 hands and 2 feet and cardboard tubes for the arms and legs. Paint the boxes and tubes black. When they are dry paint on the bones in white paint. 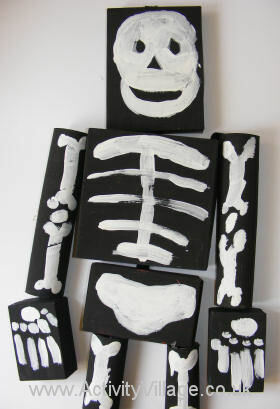 When all the paint is dry join the skeleton together with elastic taped to the back of the boxes. Dont forget to add a piece to the top of the head so that you can hang him up! This skeleton shakes, rattles and rolls!